Call before you dig 811 doesn’t locate everything. Make The Underground Detective your second call for all of your private onsite utilities. Utilizing the most advanced technology in the field, we strive to provide contractors, excavators, drillers, surveyors, engineer site planners, and/or homeowners with the best possible knowledge of all underground utilities. This will help avoid any potential hazards and/or assist in proper site utility planning or excavation. Our goal is to help people save time, money, and valuable resources, while providing state-of-the-art Underground Location Services with utility locating, utility mapping, vacuum excavation, and pipe inspections. Our customer service, employee training, and years of experience make us the leaders in private underground information. 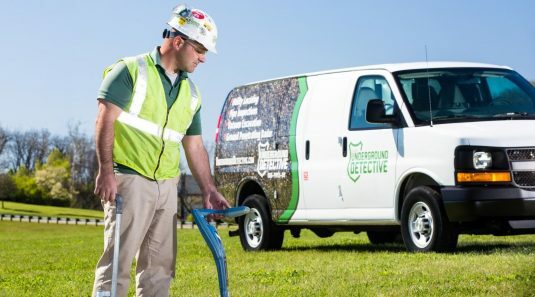 We are a full service underground location service company that locates and marks any and all utility lines and subsurface structures on your job site. We work with both publicly or privately owned properties in Cincinnati, Toledo, Philadelphia, Atlanta, Chicago, Kansas City, Jefferson City, St. Louis, Nashville, and Pittsburgh. Contact us for general inquiries or Request a Quote for our specific services.